The Wimpy Kid phenomenon began as a comic on funbrain.com in 2004. Twenty million hits there led to both a film franchise and a run of #1 bestselling books. Ten years later, millions of kids wait eagerly for each new volume, and they read them cover-to-cover the moment they get their hands on them. First, the series’ protagonist, Greg Heffley, is the quintessential everykid suffering through the traumas of middle school: friends, bullies, brothers, girls, sports, parents, increasing expectations—in other words, the traumas of growing up with no particular gifts. He’s desperate for attention, to be someone, but with one poor decision after another, he makes (an amusing) mess of everything. It’s likely both reassuring for Greg’s fans to see him share their struggles—and comforting to know theirs are not that bad. But what is also surely attractive to the series’ legion of readers is Kinney’s knack for depicting life less like grown-ups think or wish it should be for most kids, but more like it actually is. 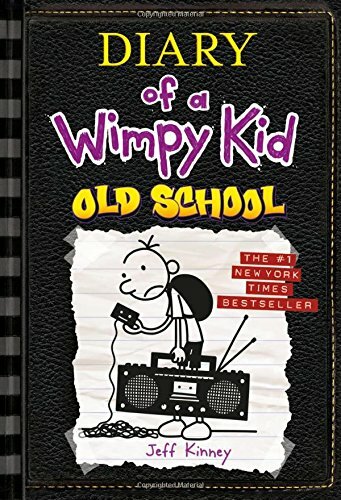 His tenth installment, Diary of a Wimpy Kid: Old School, is full of such reality-checks: mom’s social activism is misguided and embarrassing; dad’s insisting that things were better “back in the day” is bunk concocted from selective memories; supposedly simple endeavors like setting up a lemonade stand never work out because there’s always some annoying neighbor kid who does it better; team-building exercises usually end in disaster; and finally, outdoor school stinks (literally). A related appeal is Kinney’s depiction of adults. In the Wimpy Kid books they tend to be well-meaning but additional causes of trauma. If they are competent (and very few are), they make Greg’s life more difficult. If they are not competent, they make Greg’s life a lot more difficult. This applies, of course, to Greg’s parents, but Kinney has a nice way by the end of each book of, if not resolving, at least re-setting whatever crisis has arisen between them. Finally, there is the undeniable charm of Kinney’s art. His illustrations are pretty hilarious. The range of body types and facial expressions he portrays via simple black lines is remarkable. And he inserts the pictures with good comic timing. The combination of handwriting font broken every few paragraphs with drawings makes for an unchallenging read (perhaps an additional appeal), but Wimpy Kid books are nonetheless highly engaging, offering comedy but also real issues to chew on, should a young reader be so inclined. This formula—and a decade of fan devotion—will no doubt guarantee the success of Diary of a Wimpy Kid: Old School, but this entry feels a bit loose. The book has several plot threads unrelated to its “old school” theme (for example, Greg is allowing a brilliant third grader to do his homework and the family’s pig has more privileges than he does), which seem to unravel once the outdoor school story takes over. But what ties all of hapless Greg Heffley’s escapades together well enough and seals his charm (and likely guarantees demand for an 11th book) is that through it all he remains a loveable loser who never learns, yet somehow manages to come away from each debacle at least a smidgen wiser. He’s like so many of us that way, kids and grown-ups, wimpy or not. Funny how that goes. David Michael Slater is an acclaimed and award-winning author of books for children, teens, and adults. His books include Cheese Louise!, Flour Girl, Ned Loses His Head, and the controversial teen series Forbidden Books.